Today, lets take a look at the dimensions of the playing space, the maneuver tool, and the measuring tool. Armada Measurement Tool is just a bit longer than X-Wing. 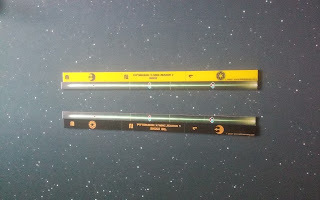 The measuring tool for the game is exactly 1' in length, unlike the similar ruler for X-Wing which is just under that. That means you can accurately measure out the play space for the game using just the measuring tool and a marking device. The tool is also useful for measuring out the 4' setup area, as it is just one measuring tool in from edge. For the ranges, short range is the largest, being just slightly smaller than distance 2 for its size, and about an inch shorter than the 2 speed mark on the maneuver tool. However, this does mean that a ship moving at speed 2 directly away from an enemy can completely escape short range. Medium range is the smallest band comparatively, corresponding to roughly distance 3 on the distance side, or just a bit short of speed 3 on the maneuver tool. Long range is obviously equal to distance 5, but is also greater than speed 4 on the maneuver tool, by close to 2 inches. 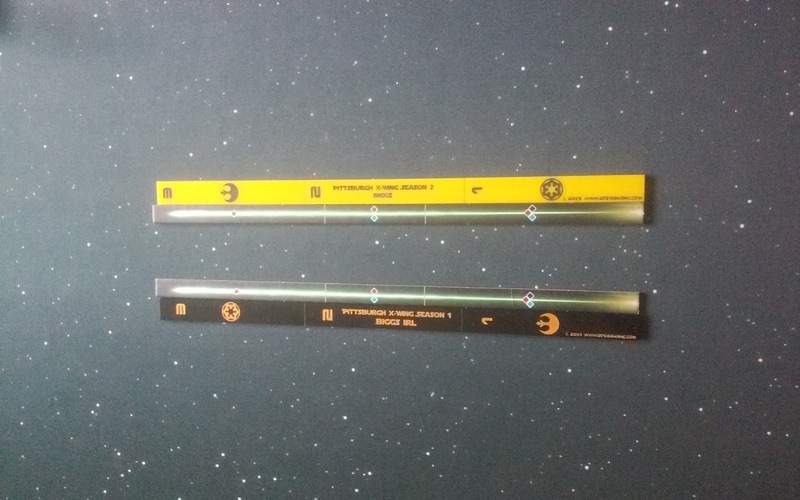 Interestingly enough, the range band for close range is actually slightly longer than the range band for long range, so you definitely cannot use the measuring tool backwards, unlike with X-Wing. For the distance side of the measuring tool, distance 1 is the largest of the bands, roughly the side of a small base length, with 2 being the shortest, at roughly the size of a small base width. Together, they add up to roughly short range, or just under speed 2. Distance 3, 4, and 5 area the same size, though 1 and 2 together is greater than 3 and 4. Comparisons from the front of the 0 speed movement. Now, the last thing you want to do is fly off the board, so you'll be happy to know that if you are pointed directly at the opposite side of the board, lined up as far forward as you can, you need a total of 9 movement straight ahead before you fall off, though if you are in a slow turning, medium size, ship, 7 will get you to the point of no return. That is about distance 3 from the edge, or medium range, so keep it in mind if you want to be coming in hot. EDIT: Here is an excellent point added by Ransburger on the FFG forums in regards to the article. At deployment assuming both players start directly across from each other and deployed as far forward as possible, there are approximately 8 movement between them. It will take 4 to get to long range, about 5.5 to get to medium range, and 6.5 to get to close range. Use those numbers to estimate how fast to go to try to get an optimal engagement time. For instance, Your opponent puts down a Vic 1 as far forward as possible at speed 1. If you put down your Nebulon as far forward as possible at speed 1, after 2 turns are over you've closed the gap by 4 movement, but the vic gets to fire first. Instead if you put your Nebulon back about 0.5 movement, after 2 turns there would still be 4.5movement between you, allowing the vic to drift into range on its activation. Alternatively you could start the Neb at 2 and then take it to 1on its second turn. That would get you to engagement range a turn sooner. The movement tool corresponds closely, but not exactly to the relative fighter squadron speeds, with a speed of 4 being roughly halfway between a distance of 4 and 5. Speed 3 is also just outside of medium range, though any ship moving at speed 3 from directly beside another would almost certainly have its base still within medium range. Small ships are just about the size for 1 speed on the maneuver tool, moving nearly their entire base forward in distance. Medium ships are slightly larger, taking up about 1.5 times of a single 1 speed maneuver. Turns are all equal, at 1/16th of a turn per click of yaw. Do to how the clicks interact, and where you have to place your ship, the total distance traveled by your front corner where the maneuver tool was inserted will remain fairly constant, however the other parts of your ship can travel quite a bit farther. For example, a GSD taking an Engine Tech boosted speed 1 double maneuver turning 2 yaw to the right each time, will have his Right Fore corner move roughly 2 distance, the same as if he had moved straight. However, his Left Fore corner will have moved a distance of 3 from its original position, and his Left Rear corner will have moved nearly to distance 4! For another example, a VSD has spent a navigation token to move at 2 speed, and spent 1 yaw to turn right on each of his maneuver clicks. While the total amount of distance his Right Fore corner moved is roughly the same, though the trajectory has changed, his Left Fore has now moved itself nearly a medium range worth of distance, directly in front of where the Right Fore used to be. What does this mean to you? What it means is that you can use turns and yaw to your advantage. 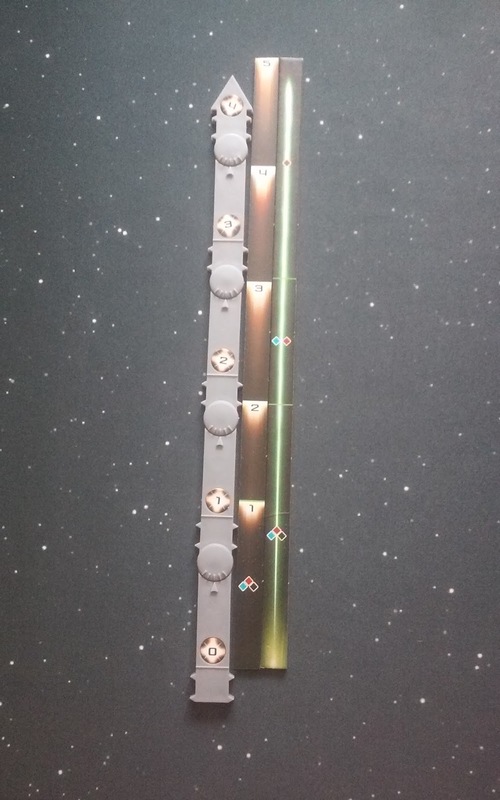 Not just getting an extra arc on a target you want to focus down, you can turn (especially with larger base ships) to get an arc that you want closer to your enemy. It also means that if you are running from an opponent, you should try to square up your aft with their closest point, to try and squeeze every bit of distance between the two of you. Well that is it for the measuring tools. I am not entirely sure about what to discuss next, but I have a few ideas. Should I go over the geometry of measuring the shortest distance between a point and a line (relating to the recent changes in the FAQ)? 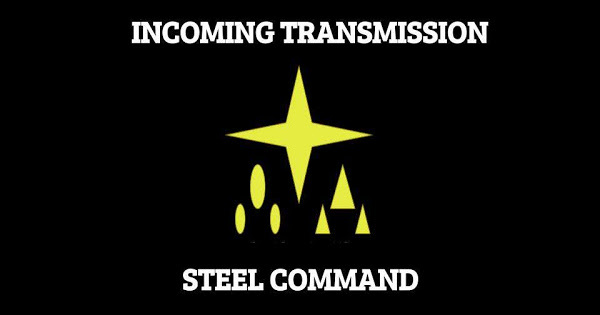 Should I talk about how to use Vassal with the Armada module and play online? Should I do an opinion piece on the recent Nationals championship at GenCon? Let me know!